Naviance is evolving in four key areas that will help more students reach their long-term goals. Read how Megan's internship led her to her career field today. Mental illness and substance abuse are a central conversation throughout the middle- and high school years. TeenLife’s 2017 Guide to Therapeutic Programs and Services is designed to help parents, counselors, and school staff navigate this challenging time and discover resources to help along the way. 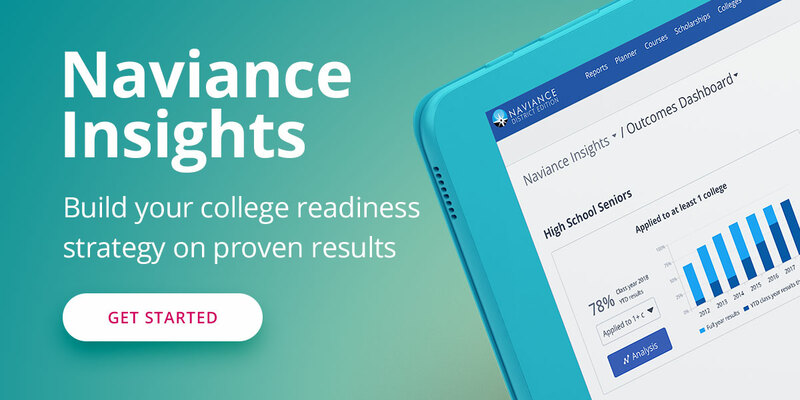 Naviance has been awarded the title of Best College and Career Readiness Solution by the Software & Information Industry Association (SIIA) as part of their CODiE Award initiative. As part of a peer-reviewed process, Naviance was evaluated in areas such as assessment availability, customization, feature set, integration of partner resources, flexibility, reporting, innovation, and usability. Naviance, in a competitive category of five semi-finalists, emerged in the top spot. Orange Unified School District is located in southern California and includes four comprehensive high schools and six middle schools. With a goal of serving all students with a purposeful college and career readiness plan, Orange recently put a focus on Naviance usage in their middle schools in an effort to ensure that all students have a comprehensive plan for postsecondary readiness. Why we organise Naviance Regional Institutes and why they are important according to one of our client outreach specialists.